Mumbai police won many hearts by the fulfilling the dream of a 7-year-old cancer patient, Arpit Mandal who wanted to become a police inspector. Arpit Mandal aspired to become the police inspector and today Mumbai police made him Police inspector for a day. The social media team of the Mumbai police shared the pictures of a young boy on Twitter and praised his spirit and dream to become the police inspector. On Friday, Mumbai police fulfilled the dream of a 7-year-old cancer patient, Arpit Mandal who wanted to become a police inspector. Mumbai police won many hearts by the fulfilling the dream of small eyes and gave him a bit of happiness. Arpit Mandal aspired to become the police inspector and today Mumbai police made him Police inspector for 1 day. Arpit was given of the charge of Mulund police station for a day. The social media team of the Mumbai police shared the pictures of a young boy on Twitter and praised his spirit and dream to become the police inspector. In a tweet, Mumbai police shared pictures of a young boy sitting on the chair of in-charge surrounded by other police officers. 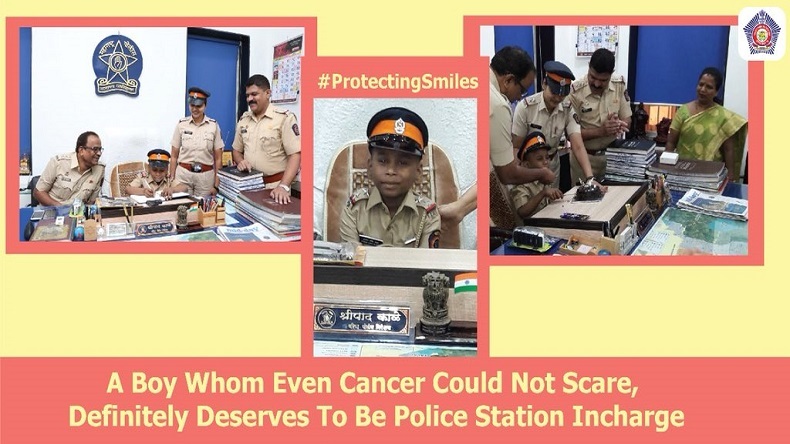 Mumbai police tweet reads, “Mulund Police Station was completely won over by the undaunted spirit of 7-year-old Arpit Mandal, fighting cancer! If we could, we would fulfill all his wishes beyond just being a Police inspector for a day #ProtectingSmiles @MakeAWishIndia.” In the photos, Arpit is holding the chair and wearing the uniform of a police inspector. This act from Mumbai police won many hearts as they fulfilled the dream of a 7-year-old cancer patient.